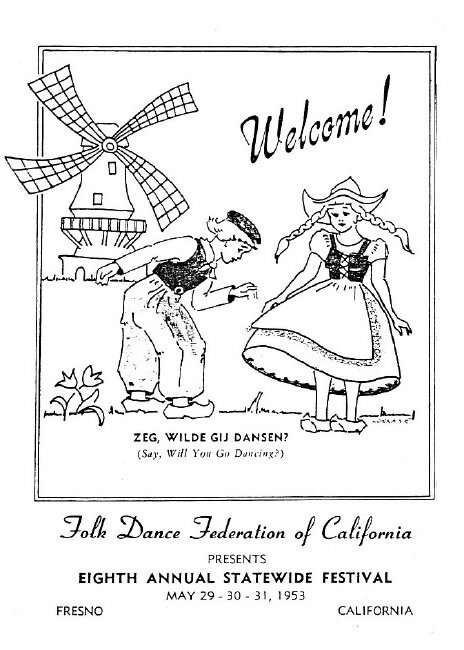 After our big binge in Oakland at Statewide '52, our thoughts for '53 turned to Fresno where the Fresno Folk Dance Council would host the 8th Annual Statewide Festival. Located almost an equi-distance between North and South, we welcomed the short drive to this charming Central Valley city. Chairman "Wat" McGugin promised us an exciting three days with a Dutch twist as the program suggests. Being something of an international city, we again were treated to a wide variety of international foods at beautiful Memorial Auditorium. The three-day Festival, held May 29, 30, and 31, offered time for us also to sample some of the fine Basque cuisine only Fresno can offer. We had our favorite spot to gather in groups of 20 to 30 costumed dancers and at times we were able to set up our equipment and folk dance or try our hand at ballroom dancing with music from the juke box. As to the program, there was a Friday Warm-up Party at the Auditorium, followed on Saturday afternoon by a combination Square-Folk Dance Institute. The teachers were Jack McKay and Lucile Czarnowski. For some reason the Saturday night Party was held at the Old Auditorium. The Sunday morning Breakfast Evaluation Meeting was chaired by George Merton. Following the breakfast I participated in a North-South Relations Committee and here for the first time met Bob Moriarty from the South and we have remained good friends since that time. Sunday afternoon we returned to the large Memorial Auditorium where the fine international food was again offered and the booths freely patronized. Both president Leonard Murphy for the North and Harvard Hicks for the South were introduced as were members of the Fresno Committee who had done such a good job. 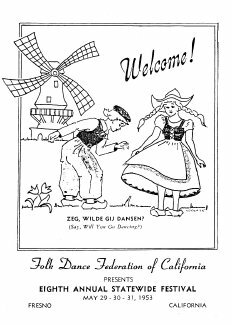 The three Northern California record dealers, Dave Boyce, Phil Maron, and Ed Kremers, were busy plying their trade, offering records for the new dances taught at the Institute as well as most popular folk dance selections. It was great to visit Fresno again and everyone had a fine time as always. The cover was designed by Lorraine.